Few things say Fall like the pumpkin, along with all the delicious things that you can make with one. Every year I stock up on multiples cans of pumpkin puree for muffins, pancakes, oatmeal and, of course, pie. But this year is different. 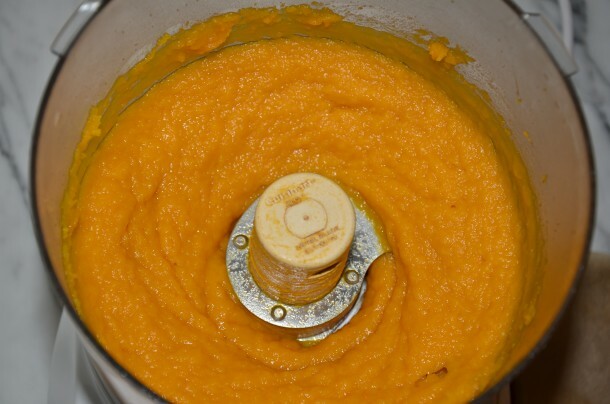 After being discouraged by all the BPA in can liners that our bodies absorb, I decided pumpkin purée from scratch was worth trying. Well, wouldn’t you know – not so difficult and not surprisingly the fresh pumpkin tastes infinitely better than canned! Certainly it is way easier to pop a can open, but I am now a convert. 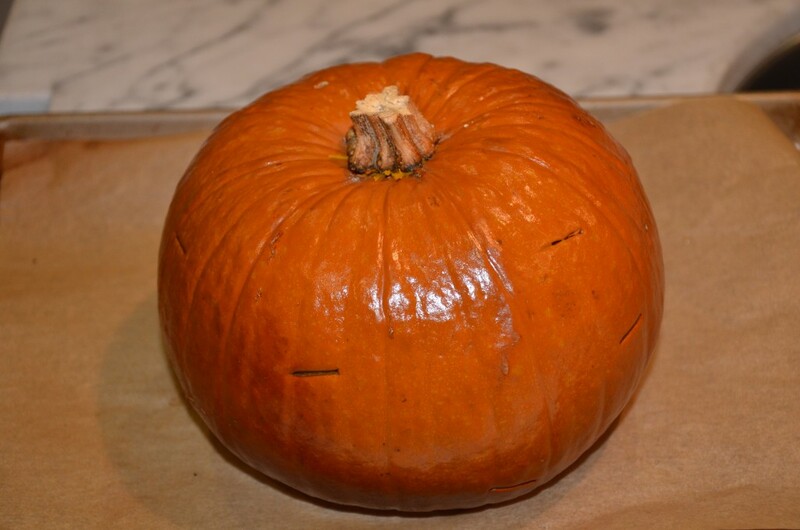 I tried multiple methods of cooking pumpkin – steaming, cut in half, covered. The winner was roasting the pumpkin whole, with several slits cut into the flesh and tented with foil. Most of the time, the pumpkin was flavorful and smooth. Unfortunately, Mother Nature is not always consistent, so not every pumpkin turns out the same. I’m sure pumpkin’s dark orange color is a clue to how rich it is in Beta-carotene, which your body converts to Vitamin A. If not, you need to read my blog more often! Also, let’s not forget that pumpkin is loaded with fiber, Vitamin C, Folate and Vitamin E. Can you say nutritional powerhouse? Roast away and freeze your purée for a rainy day. Stay tuned for a delicious recipe using pumpkin purée. Begin with a pumpkin suitable for eating, such as Sugar Pie. 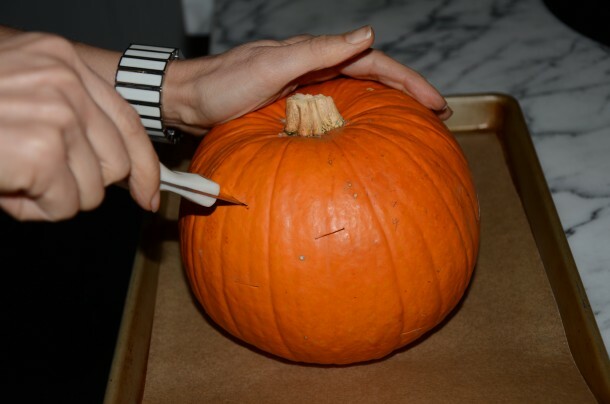 Poke the pumpkin all over with a knife and place on a parchment-lined baking sheet. 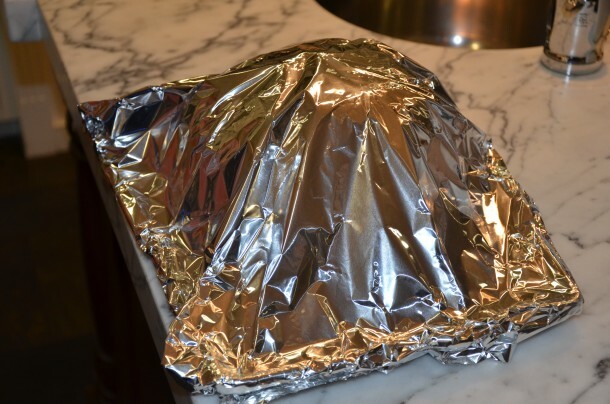 Tent with aluminum foil and bake for about 1 ½ hours* until very tender and starting to lose its shape. 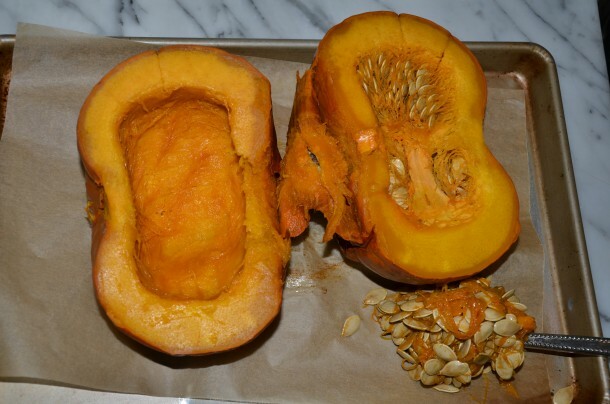 When the pumpkin is cool enough to handle, cut in half and remove the seeds and stringy center. 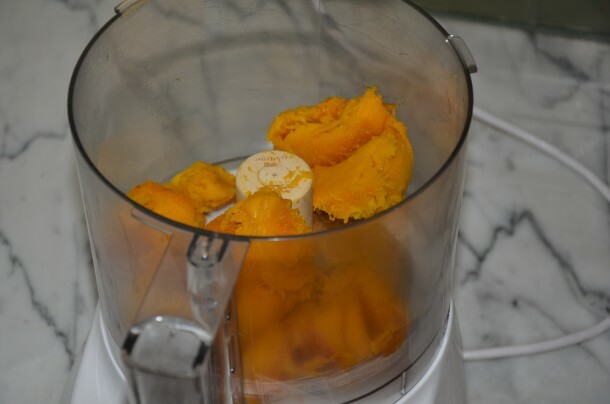 Separate the flesh from the skin and puree the flesh in a food processor until smooth. Do this in batches, if necessary. A smaller pumpkin requires less cooking time. Can we make this ahead of time and freeze? i goofed and already cut up the pumpkin instead of leaving it whole. I have the skin on and quartered the pumpkin into long strips. what would you say is the best way for me to cook it now? the skin is still on. I was going to lay it down on a baking sheet like the spaghetti squash skin up. let me know what yo think is best and how many degrees etc. HOw about you place the wedges in a baking dish with a little water and roast them covered in the oven until tender? 350? I don’t know how long it would take, but take a peek after 20 minutes and see if the flesh is easily pierceable with a paring knife! This was amazingly simple! I have to say, I went into it VERY skeptical, but I can’t believe how truly easy it was. Now I need to find a yummy pumpkin soup recipe! You’re funny. Obviously opening up a can is easier, but I think the flavor from fresh is so much better, and you’re right — perfectly easy. I’ve had very good luck substituting pumpkin puree for other winter squash purees like butternut squash. You could use it to make muffins and pie, but why not a risotto? Add the roasted pumpkin to risotto. It was so creamy and delicious. Nothing beats the real deal! I agree! Pumpkin puree from scratch actually tastes good, whereas the canned stuff has absolutely no flavor. My 13 year old begged me to make a pumpkin pie from scratch. This was a lot easier than I thought it would be. I never would have tried this but I’m glad I did, the pie we made was the best. Listen, opening a can is easier, but this isn’t tough and it’s waaaaaaay better! I thought it would be very difficult to determine if the pumpkin was done. But it was very easy and it felt good to be using pure pumpkin!